We have noticed there are some pretty strong and/or negative opinions regarding our 1-hour adoption radius for puppy adoptions and our 2-hour adoption radius for adult dog adoptions. While it disheartens us to hear such negativity, we think this is a great opportunity to share with everyone as to why we have this policy. We want to start off by simply stating this is our – Peppermint Pig Animal Rescue’s – policy, and if you do not agree, we respect your opinion and encourage you to rescue from a shelter local to you, or seek other rescues for your next furry family member. There are many animals in need all over the US where you have the opportunity to save a life regardless of your location. However, because we are an organization run on 100% volunteer time, we do have to place some guidelines as to where we spend our time in the most valuable way; this is just a fact. We would like to be clear that our policies and procedures are always put in place with our rescue dogs as our first, and foremost, priority. Based on over 13 years of successful, and failed adoptions, working closely with shelters, trainers, and the public, we have gained some very good experience in determining what our dogs and organization need to survive and continue our work. One of the parameters we have had to set for our adoption application protocol is a reasonable distance we, as volunteers, can travel to facilitate home and fence checks. We have collectively determined that our adoption radius is a good range for our volunteers to travel. And of course the expense (gas and wear and tear of vehicles) of said travel is generously donated by our volunteers. So, when deciding on our distance, we consider our volunteer commitment and expectations and feel that this is a very reasonable distance for all who dedicate their time and energies to finding homes for our rescue dogs. Many have asked if they can have another rescue do a home or fence check, to which our answer is, no. We are a private rescue with our own policies and requirements and we are the ones who are making the lifetime commitment to our dogs, not the other rescues. So, we need to be the ones to assess and evaluate homes for our dogs. The one-hour-radius for our puppy adoptions is set in place due to our understanding that it is in the best interest of the puppy to physically mature before sterilization surgery. Many of our rescue puppies are adopted at 8 weeks old, and based on evidence, we do not believe this is an appropriate age for sterilization. We provide all puppy spays and neuters through our vet when they reach the appropriate age for the surgery. This is a same-day surgery that is done at our local vet. We also require all puppy adopters to bring the puppies back to PPAR to receive their 12 and 16 week puppy vaccinations. In effort to ensure there are no issues with the adopters being able to drive back to our area up to 3 times for these procedures, we require that all puppy adopters live within a one-hour radius of Cincinnati. We also take into consideration the distance our volunteers will have to travel to collect the puppy if the spay/neuter/vaccination contract is breached. It is of the utmost importance that we are thorough in our work and approval processes. In addition, we like to be able provide a trainer to adopters who may need it, to which we require our adoption coordinators to commit, evaluate, and make arrangements for. They do it with a smile, but this, too, takes time and a lot of work. The trainer we supply to our adopters also has guidelines in place as to how far she is able to travel. So, when deciding on our distance, we consider the time it takes in evaluating for a trainer, how far the trainer can travel, and finding homes that are the right match for our rescue dogs. Many of our critics express frustration because they, or someone they know, could provide a “good” home for a dog but live outside of our radius. However, it is our firm belief, in order to achieve a well-balanced, happy home for our dogs, it requires more commitment than most understand, and goes beyond just being a good home. A truly happy and balanced home for our rescue dogs requires love, exceptional health care, understanding, willingness to create structure, and an appropriate environment for them to succeed. We strive to be a constant resource for our adopters to help provide training guidance, answer questions that may arise, function as a supportive group post-adoption, and facilitate the best transition of our dogs into their new homes. Simply put, we need to have the ability to have hands-on access with our adopters in order to ensure forever placement of our dogs. We can do this by adhering to the protocol we have established, which was developed after several years of experience. So, when deciding on our distance, we consider how we can provide life-long assistance for our dogs since Peppermint Pig Animal Rescue commits to them for their entire life. The work we do at PPAR has been well thought out and developed through trial and error, sweat and tears, and reflection and growth as a group. While we believe in respectful disagreement, we do not apologize for our guidelines, protocols, and procedures. 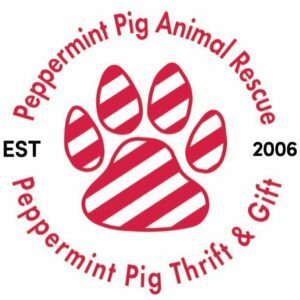 Peppermint Pig Animal Rescue is rooted in our mission to make a difference for the animals, save lives, and build happy loving homes with a rescue pet in them. Everything we do is based on our mission and we can solidly stand behind that. Special thanks to Adore-A-Bull Rescue for permissions to reference the AABR website and for their dedication to the rescue, rehabilitation, and rehoming services they provide for Cincinnati’s PitBulls.